Elton John, a big star for well over three decades, is a unique case in rock memorabilia. He’s been periodically getting rid of his own artefacts for almost 20 years now. He’ll regularly sell off his clothes, cars, and even his furniture, usually to raise money for charity (although in some cases just a kind of extreme house cleaning). Of course, the belongings he sells off are high-end items – Jaguars, Rolls Royces, Bentleys, clothes from the top designers – and can command huge prices for some items. However, there’s essentially so much Elton memorabilia out there, especially clothes, that the prices are very reasonable indeed – for example, a Versace suit went at auction for £250, which is less than it would cost new. Of course, Elton remains very active and prolific, so that as collectables and investments, his memorabilia isn’t yet exceptionally worthwhile, and the fact that he shows no signs of slowing down means it’ll be a good few years before the prices really increase. So, if you want some luxury, collect, by all means, but don’t expect a strong return for a long time. If you want clothing, that’s easy to find, and direct from the source, too - every year, Elton’s Closet, a shop to sell his clothing, is opened briefly in a different city. If you’re a serious collector, this is the place to find things. Elton held the first auction of his memorabilia in 1988, when he auctioned off a staggering 20,000 items through Sotheby’s, which took in a total of £10 million. On another occasion he auctioned off 20 of his 28 cars, for a total of £2 million (the vehicles included a couple of Rollers, two Ferraris and a Jaguar). 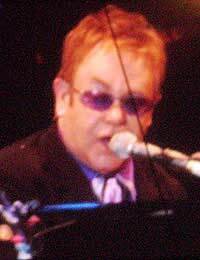 In his time Elton’s sold many millions of records and gained more awards than he can possibly display, which might explain why platinum discs are up for sale at times. The prices are exceptionally low – around £250-300, quite shocking for an artist of his stature. Even handwritten items don’t go for a great deal – often £100-200, making them affordable, even as long-term investments. It’s not exactly a problem for collectors, since it keeps prices low and guarantees availability, but there’s simply so much Elton John memorabilia out there that it’s easy to obtain. Even dealer prices are quite low, a reflection of the market. You can find autographed LPs and photos for £50-100, and concert programmes, even quite old ones, are far less. However, there’ll be little appreciation in value on these. The best advice is to be choosy about the items you look for – the more unusual, the better the chance of reselling soon at a profit. However, for those, in auction, you’ll be competing against dealers. It might be worth going for vintage tour tee shirts, as long as you can be sure they’re authentic. For clothes, the best solution is to discover where the Elton’s Closet sale will be and travel there. If that’s not possible, though, look for dealers and auctions online. Perhaps the most surprising thing is that many of them have only a few items available. It might also be worth checking eBay, although it has to be said that the odds for finding good memorabilia there are low.